Our Brampton school bus fleet consists of ~150 buses of various types including wheelchair accessible vehicles. Our team is made up of caring and best-in-class drivers, mechanics, safety and school bus operations managers. We proudly service the needs of Student Transportation of Peel Region (STOPR, the consortium of Peel district school boards including the Dufferin-Peel Catholic District School Board and the Peel District School Board), schools and a range of other groups for their local trip needs. Our full service Brampton school bus operations provides contract school bus services for districts and private schools and organizations. This includes special needs transportation and budget-friendly bus rentals for private groups. Need an upscale party bus for your special event? Then ask about our air-conditioned coach style party buses. These party buses are perfect for weddings, corporate or other party events. No matter what your group type or your destination, we will get you there safely, securely and reliably! Our Brampton branch location provides school bus transportation and special party bus rentals serving Brampton and the surrounding Greater Toronto Area. Whether your destination is the local community centre, festival or Niagara Falls – we’ll get you there safe and on time! Our Branch Manager Tom Kobayashi welcomes the opportunity to discuss our services and how they can help your organization. Whether a one-time charter or contract school transportation services, our team is ready to help. Contact us today! We’re 170 employees strong at our Brampton school bus operating location and are looking for more safety leaders. 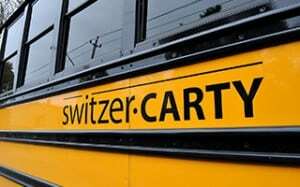 If you’re interested in joining Switzer-Carty Transportation in Brampton and becoming part of a Team that cares about its people and customers, please apply here and we’ll gladly contact you.